Description Father Fitzgerald was born in 1922 in Washington, D.C. A graduate of St. Paul's Parochial School and Gonzaga High School, he studied at Georgetown University from 1938-1939, when he entered the Society of Jesus novitiate at Wernersville, Pennsylvania. Father Fitzgerald received his B.A. in 1945 and an M.A. in 1948 from Woodstock College. Ordained a priest in 1952 in Louvain, Belgium, he went on to earn his Ph.D. in Classical Languages from the University of Chicago in 1957. 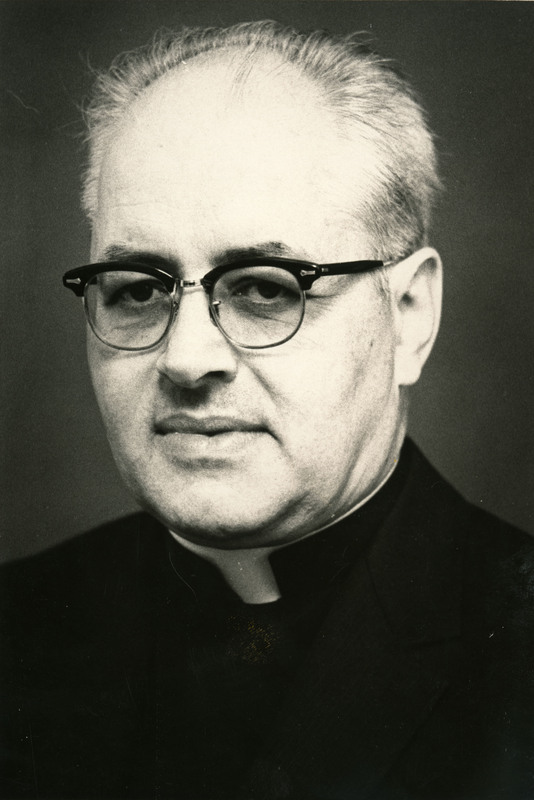 Father Fitzgerald served as president of Fairfield University from 1973 through 1979, overseeing the construction of the Student Recreational Complex and the Center for Financial Studies, which has since become the home of the Dolan School of Business. He also directed the creation of the School of Business in 1978, which had been the Department of Business Administration for 31 years within the College of Arts and Sciences. After leaving Fairfield in 1979, Father Fitzgerald became President of Saint Louis University and also went on to teach at Loyola College in Baltimore and Georgetown in Washington, D.C. Fairfield University created the Rev. Thomas R. Fitzgerald Chair in Marketing in his honor in 2004 as part of the Dolan School of Business. Original Format Photographic print; black-and-white; 5 x 7 in.